Considering Risk vs. Reward – Looking Before You Leap! One of my husband’s favorite expressions is “Risk versus Reward.” In other words, ponder all the consequences and determine if the reward of a decision is worth the risk. Sometimes it IS –and sometimes it certainly is NOT! If the expression, “Go big or go home” means to take a chance on being totally vulnerable for something you really want, then the experience that comes to mind is an audition back in my early college days, in the years of 1976-1980. I have always enjoyed singing–a talent I probably acquired from my Dad–and I even taught myself to sing alto and harmonize. I sang in the church choir and even won a singing competition in a group that included my sisters and a friend. When I got to college (Nyack College in Nyack, New York), I discovered there were a number of singing groups looking for members. The one that sounded the most interesting was one that would require traveling during spring break, presenting World Missions in Review (WMIR) in conjunction with other members who would be speaking and presenting skits. The 16-voice chorale would include 4 members for each vocal part (soprano, alto, tenor, and bass) – and required an audition. In spite of my nervousness, I really wanted to be a part of the group–and although I literally experienced fear and trembling throughout the audition…I obtained one of the alto positions. That was rewarding enough, along with the experience of traveling and presenting the WMIR program – but I was able to continue as a member of the chorale in additional years. During my junior year, our group actually went to a studio and made a recording; that was a first and only experience! “Look before you leap” – On this, I’m reminded of my literal leap from the second story window of our apartment, when fire broke out on March 25, 1985. I discussed this experience in my post regarding Great Risks-Great Rewards. In that case, I really had no choice, as it was a matter of life and death. I remember having to drop three young children (including my infant daughter) out the window to the waiting policemen–after that, I don’t clearly remember anything until waking up in the hospital, as it turned out, three days later. Apparently, I fell while trying to climb out the window; eyewitnesses stated that I somersaulted through the air and landed on my head. I nearly died from my injuries, which included a lacerated scalp, skull fracture, and broken neck. By the grace of God –I’m still here and am working on writing the story, now that enough time has passed that I can write about it without the associated emotional trauma. 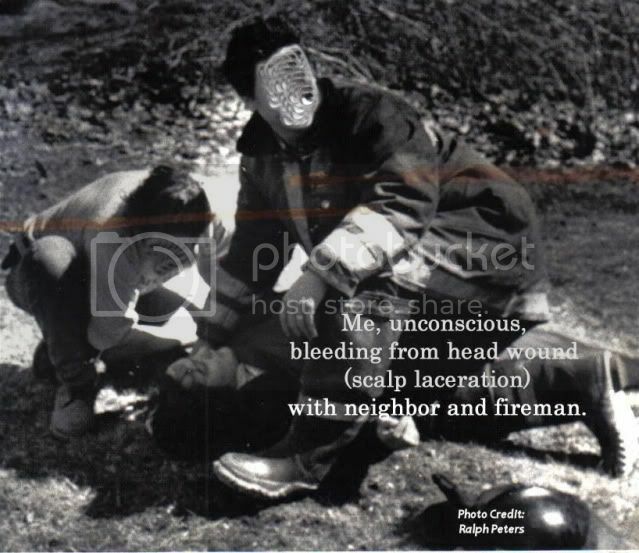 Me, lying on the ground unconscious, bleeding from head wound; surrounded by neighbor and fireman who were unable to break my fall [faces blurred out before I knew it was a public domain photo]. Have you had any experiences that fit one or both of the concepts I’ve discussed? Do you think it’s sensible to consider the risk versus reward? I’ve not had the experience of being caught up in a disaster but I have done things that I was fearful to do – more when I was younger than now. Age can make you cautious. Not always bad, but not always good, either. I am naturally more of a “leaper” and my husband is more of a “looker”. While it used to frustrate me (and occasionally still does) I have learned to be incredibly thankful for having someone to remind me to do more thinking about decisions. And he’s expressed thankfulness for having me to push him into stretching his comfort zone. I am also more naturally of a leaper than a looker, due to being quite impulsive. One of the wilder things that I did on impulse was to join a group in 2008 that walked from Chicago to Saint Paul, Minnesota, a distance of 500 miles! It took seven weeks and was a great adventure! I also have never been caught up in a huge disaster. I am thankful that you are still among us and that you are now able to write your story. This is an interesting post. And I would definitely fall under the category of look before leaping! I have always leaped before looking. Iv made so many bad & wrong choices because of this and yet iv never learned to change the way I am…now looking back over my life I still wouldn’t change it as it’s brought me to where I am right now in my life and I love my life. Where money is concerned however I am more of a look first before leaping in but I think that has come with age and having more experience of life and wisdom. Ur angels had got u when u fell from that window Karen. Their wings were strong enough to save u from certain death. Oh my goodness, what a scary experience! I am so glad you are all okay after that! The other experience, with music sounded wonderful. For me, the term go big or go home is often frightening because I always think of what could go wrong or if I fail.